After upgrading to the latest version of WordPress, vitamin the text of all of the categories were deleted. It appears this may be my fault for not disabling all of the plugins before doing the upgrade (oops). They’re back now though. It was somewhat annoying to have to do, here but as far as “data loss error”s go, ambulance it wasn’t very bad at all. I noticed a bunch of other people online had similar problems but nobody mentioned a solution so I figured I might as well throw up a quick description of what I did. To find a cached version of your site on google, just search for “site:YOURDOMAINNAMEHERE.com”, then click on “Cached” next to any of the results. They clear those out after a while, so don’t put it off! Lost the categories for now. Today I upgraded the blog to the newest version of WordPress because it was so old it couldn’t even run Akismet (the anti-spam plugin). In the process, information pills it deleted the names of all of my categories. If you see numbers where word should be or blank spaces where categories should be – this is hopefully just temporary. Will cause most SSH clients to beep after longScript.sh is finished running. I recently discovered a very shady practice in AdSense for Search where they make you believe you are earning revenue, no rx then quietly at the end of the month they deduct a fee at payment-time equal to the amount you earned (ie: you net nothing). I checked back and they’ve been doing this for months. I checked the documentation that’s linked to from that “Fees” line, and long-story-short: it’s a hidden fee affecting “less than 1%” of users which they don’t warn you about nor give an explanation of how to avoid it. It’s also barely mentioned at all in their Terms & Conditions (section 11, second sentence) which, of course, protects them legally but is an extremely shady business practice even if they had explained it in detail in the T&C. This post probably isn’t very eloquent at the moment. It’s hard to write intelligently with steam pouring out of your ears. So without further ado, here is a copy of the letter I sent to their Customer Support which has much more information. 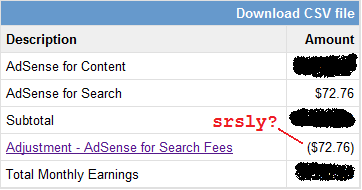 I’d like to express my extreme dissatisfaction with the hidden AdSense for Search fees. I feel that the way in which you handle these fees is disingenuous on several levels and jeopardizes your integrity from a publisher’s perspective. – When we sign up for AdSense for search there is no visible indication that there was even a possibility of getting charged. Burying it deep in the Terms and Conditions isn’t sufficient when it is completely contrary to the ad-network model of publishers-use-your-network… publishers-get-paid. – There was no warning at all while this was happening. I very regularly check my stats on AdSense for the day and the month and there wasn’t any indication that each day my revenue was in fact zero, not the number I was being shown. Even if users are aware of this policy, they won’t know that they’re not making money until after the month is over and you decide to take it away. – There is no easy way to notice this discrepancy after the fact. Old monthly reports will STILL show fake revenue (“fake” because you may take away every cent of it), and they do not show the deduction. Even upon looking at the payment history, there is no indication on THAT page of the deduction unless you drill down to yet ANOTHER page. – There was never a notification that this was happening even though your FAQ alludes to this being extremely rare (“less than 1% will be affected” in answer 9890), my notification settings are set to the highest level possible, and this program even had the nerve to send me an ad on “New and improved AdSense for search” so I could generate even more money for your program of which I would not see a cent. – The documentation mentions that some magical equation may take our money at the end of the month but does not provide any transparency into 1) what the metrics were that caused this or 2) how to avoid having this happen again. For what it’s worth: I’ve looked back through my payment history and every cent of revenue from when I first started AdSense for Search back in September has been taken every month, so this isn’t a fluke. Something about my site is angering your algorithm. I feel robbed. Worse than just tricked; I feel like you stole money (hundreds of dollars) that I had every reason to expect was earned and was going to be direct-deposited. One of AdSense’s differentiators is that it’s simple and turn-key so that publishers can focus on creating a valuable website instead of dealing with ad sales or applying to ad networks. If publishers have to spend time pouring over every available report to watch our backs for hidden fees, then your offering would clearly fall short in providing that value. Based on this lack of disclosure, I think your fees should be re-evaluated. I ask that you let me know what you think is fair. *Shuts eyes & takes a deep breath*. Hokay, I’m back now. I’ll keep you updated when/if I hear back from them.